Of the 127 women serving in the 116th Congress, 22 are Black. In addition, one Black woman and one Caribbean American woman serve as non-voting delegates in Congress, representing the District of Columbia and the U.S. Virgin Islands. These numbers do not include Senator Kamala Harris who is multiracial. Find out who's in Congress. Of the 86 women serving in statewide elective executive offices, 4 are Black. See statewide office. Of the 1,875 women state legislators serving nationwide, 275 are Black (as of 12/31/18). See state legislatures. 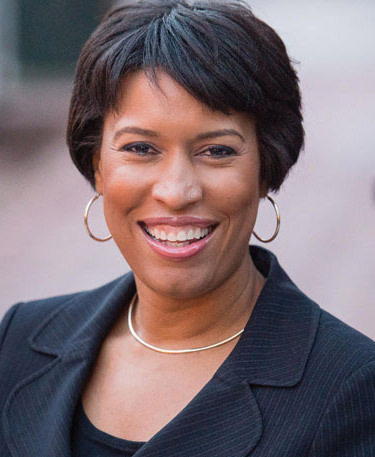 Of the 100 largest U.S. cities, seven have Black women mayors. See mayors. For more information on total numbers and percentages of women serving in various levels of office, click here. Information as of 12/31/18; 2019 numbers will be posted when available. AL 58 Rolanda Hollis (D) Rep.
AZ 04 Geraldine Peten (D) Rep.
CO 33 Angela Williams (D) Sen.
CO 08 Leslie Herod (D) Rep.
FL 13 Tracie Davis (D) Rep.
FL 45 Kamia L. Brown (D) Rep.
GA 38 Horacena E. Tate (D) Sen.
GA 39 Nikema Williams (D) Sen.
GA 43 Tonya P. Anderson (D) Sen.
GA 58 Park Cannon (D) Rep.
GA 60 Kim Schofield (D) Rep.
GA 77 Rhonda Burnough (D) Rep.
GA 84 Renitta Shannon (D) Rep.
GA 125 Sheila Clark Nelson (D) Rep.
IL 005 Juliana Stratton (D) Rep.
IL 114 LaToya N. Greenwood (D) Rep.
KY 41 Attica Scott (D) Rep.
LA 61 C. Denise Marcelle (D) Rep.
LA 63 Barbara West Carpenter (D) Rep.
MD 14 Pam Queen (D) Del. MD 20 Jheanelle K. Wilkins (D) Del. MD 41 Angela Gibson (D) Del. MD 43 Mary L. Washington (D) Del. MD 45 Cheryl D. Glenn (D) Del. MD 46 Robbyn Lewis (D) Del. ME 40 Rachel Talbot Ross (D) Rep.
MI 01 Tenisha Yancey (D) Rep.
MI 09 Sylvia Santana (D) Rep.
MN 60B Ilhan Omar (DFL) Rep.
MO 23 Barbara Anne Washington (D) Rep.
MS 38 Tammy Felder Whitherspoon (D) Sen.
MS 70 Kathy Sykes (D) Rep.
NC 29 MaryAnn Black (D) Rep.
NH ROCK17 Charlotte I. DiLorenzo (D) Rep.
NJ 22 Linda Carter (D) Assem. NJ 31 Angela McKnight (D) Assem. NJ 34 Britnee Timberlake (D) Assem. NV 01 Daniele Monroe-Moreno (D) Assem. NY 19 Roxanne Persaud (D) Sen.
NY 029 Alicia Hyndman (D) Assem. NY 059 Jaime R. Williams (D) Assem. NY 070 Inez E. Dickens (D) Assem. NY 077 Latoya Joyner (D) Assem. NY 128 Pamela Hunter (D) Assem. OH 21 Sandra Williams (D) Sen.
OH 25 Bernadine Kennedy Kent (D) Rep.
OH 35 Tavia Golanski (D) Rep.
OR 51 Janelle S. Bynum (D) Rep.
PA 203 Isabella Fitzgerald (D) Rep.
RI 05 Marcia Ranglin-Vassell (D) Rep.
SC 22 Mia S. McLeod (D) Sen.
SC 31 Rosalyn Henderson Meyers (D) Rep.
SC 70 Wendy C. Brawley (D) Rep.
TX 146 Shawn N. Thierry (D) Rep.
VA 09 Jennifer L. McClellan (D) Sen.
VA 16 Rosalyn R. Dance (D) Sen.
VA 02 Jennifer D. Carroll Foy (D) Del. VA 63 Lashrecse Aird (D) Del. WA 30B Kristine M. Reeves (D) Rep.
Of the 127 women serving in the 116th Congress, 8 are Asian American. In addition, one Asian American woman serves as a non-voting delegate in Congress representing American Samoa. These numbers do not include Senator Kamala Harris who is multiracial. Find out who's in Congress. Of the 86 women serving in statewide elective executive offices, three are Asian American. See statewide elective executive offices. Of the 1,875 women state legislators serving nationwide, 44 are Asian American (as of 12/31/18). See state legislatures. Of the 100 largest U.S. cities, two have Asian American women mayors. See mayors. AZ 20 Kimberly Yee (R) Sen.
CA 34 Janet Nguyen (R) Sen.
CA 39 Ling Ling Chang (R) Sen.
GA 89 Bee Nguyen (D) Rep.
HI 04 Lorraine R. Inouye (D) Sen.
HI 14 Donna A. Mercado Kim (D) Sen.
HI 21 Maile S.L. Shimabukuro (D) Sen.
HI 24 Jill N. Tokuda (D) Sen.
HI 04 Joy A. San Buenaventura (D) Rep.
HI 13 Lynn P. DeCoite (D) Rep.
HI 14 Nadine K. Nakamura (D) Rep.
HI 16 Dee S.P. Morikawa (D) Rep.
HI 24 Della Au Belatti (D) Rep.
HI 25 Sylvia J. Luke (D) Rep.
HI 32 Linda E. Ichiyama (D) Rep.
HI 36 Beth K. Fukumoto Chang (R) Rep.
HI 42 Sharon E. Har (D) Rep.
HI 43 Andria P. Tupola (R) Rep.
HI 45 Lauren N.K. Cheape Matsumoto (R) Rep.
HI 46 Lei R. Learmont (D) Rep.
ID 17B Sue Chew (D) Rep.
ID 31B Julie VanOrden (R) Rep.
IL 02 Theresa Mah (D) Rep.
MA BRIS12 Keiko M. Orrall (R) Rep.
MD 16 Susan C. Lee (D) Sen.
MD 15 Aruna Miller (D) Del. MD 26 Kris Valderrama (D) Del. MI 06 Stephanie L. Chang (D) Rep.
NH HILL35 Latha Mangipudi (D) Rep.
NY 65 Yuh-Line Niou (D) Assem. OK 85 Cyndi Munson (D) Rep.
PA 103 Patty H. Kim (D) Rep.
PA 178 Helen Tai (D) Rep.
TX 112 Angie Chen Button (R) Rep.
UT 04 Jani Iwamoto (D) Sen.
UT 34 Karen Kwan (D) Rep.
VA 42 Kathy Tran (D) Del. WA 45 Manka Dhingra (D) Sen.
WA 32A Cindy S. Ryu (D) Rep.
WA 33B Mia S. Gregerson (D) Rep.
WA 37A Sharon Tomiko Santos (D) Rep.
WA 48A Vandana Slatter (D) Rep.
Of the 127 women serving in the 116th Congress, 13 are Latina. In addition, one Latina serves as a non-voting delegate in Congress representing Puerto Rico. Find out who's in Congress. Of the 86 women serving in statewide elective executive offices, 5 are Latina. See statewide office. Of the 1,875 women state legislators serving nationwide, 117 are Latina (as of 12/31/18). See state legislatures. Of the 100 largest cities, one has a Latina mayor. See mayors. AZ 03 Olivia Cujero Bedford (D) Sen.
AZ 27 Catherine Miranda (D) Sen.
AZ 02 Rosanna Gabaldón (D) Rep.
AZ 04 Charlene Fernandez (D) Rep.
AZ 26 Isela Blanc (D) Rep.
AZ 26 Athena Salman (D) Rep.
AZ 27 Rebecca Rios (D) Rep.
CA 20 Connie M. Leyva (D) Sen.
CA 32 Vanessa Delgado (D) Sen.
CA 04 Cecilia M. Aguiar-Curry (D) Assem. CA 13 Susan Talamantes Eggman (D) Assem. CA 30 Anna Marie Caballero (D) Assem. CA 37 S. Monique Limon (D) Assem. CA 39 Luz Rivas (D) Assem. CA 47 Eloise G. Reyes (D) Assem. CA 48 Blanca E. Rubio (D) Assem. CA 51 Wendy Carillo (D) Assem. CA 58 Cristina Garcia (D) Assem. CA 60 Sabrina Cervantes (D) Assem. CA 65 Sharon Quirk-Silva (D) Assem. CA 80 Lorena Gonzalez (D) Assem. CO 24 Beth Martinez Humenik (R) Sen.
CO 32 Irene Aguilar (D) Sen.
CO 34 Lucia Guzman (D) Sen.
CO 05 Crisanta Duran (D) Rep.
CO 32 Adrienne H. Benavidez (D) Rep.
CT 003 Minnie Gonzalez (D) Rep.
CT 084 Hilda Santiago (D) Rep.
FL 039 Anitere Flores (R) Sen.
FL 040 Annette Taddeo (D) Sen.
FL 048 Amy Mercado (R) Rep.
FL 060 Jackeline Toledo (R) Rep.
FL 062 Janet Cruz (D) Rep.
FL 119 Jeanette Nunez (R) Rep.
GA 099 Brenda Lopez (D) Rep.
GA 117 Deborah Gonzalez (D) Rep.
IL 20 Iris Martinez (D) Sen.
IL 22 Cristina Castro (D) Sen.
IL 04 Cynthia Soto (D) Rep.
IL 21 Celina Vilanueva (D) Rep.
IL 24 Elizabeth Hernandez (D) Rep.
IL 83 Linda Chapa LaVia (D) Rep. IN 12 Mara Candelaria Reardon (D) Rep.
MA SUF02 Sonia Rosa Chang-Diaz (D) Sen.
MA ESS16 Juana B. Matias (D) Rep.
MD 18 Ana Sol Gutierrez (D) Del. MD 19 Marice I. Morales (D) Del. MD 21 Joseline Pena-Melnyk (D) Del. MI 90 Daniela Garcia (R) Rep.
MI 95 Vanessa Guerra (D) Rep.
MN 63 Patricia Torres Ray (DFL) Sen.
NH HILL31 Jessica Ayala (D) Rep.
NJ 05 Nilsa Cruz-Perez (D) Sen.
NJ 29 M. Teresa Ruiz (D) Sen.
NJ 35 Nellie Pou (D) Sen.
NJ 04 Gabriela Mosquera (D) Assem. NJ 08 Maria Rodriguez-Gregg (R) Assem. NJ 19 Yvonne Lopez (D) Assem. NJ 20 Annette Quijano (D) Assem. NJ 32 Angelica Jimenez (D) Assem. NJ 33 Annette Chaparro (D) Assem. NM 11 Linda Lopez (D) Sen.
NM 24 Nancy Rodriguez (D) Sen.
NM 07 Kelly Fajardo (R) Rep.
NM 09 Patricia A. Lundstrom (D) Rep.
NM 13 Patricia Roybal Caballero (D) Rep.
NM 15 Sarah Maetas Barnes (R) Rep.
NM 21 Debra M. Sarinana (D) Rep.
NM 25 Christine Trujillo (D) Rep.
NM 35 Angelica Rubio (D) Rep.
NM 41 Debbie A. Rodella (D) Rep.
NM 43 Stephanie Garcia Richard (D) Rep.
NM 52 Doreen Y. Gallegos (D) Rep.
NM 68 Monica Youngblood (R) Rep.
NV 10 Yvanna Cancela (D) Sen.
NV 11 Olivia Diaz (D) Assem. NV 27 Teresa Benitez-Thompson (D) Assem. NV 41 Sandra Jauregui (D) Assem. NV 42 Irene Bustamante Adams (D) Assem. NY 31 Marisol Alcantara (D) Sen.
NY 25 Nily Rozic (D) Assem. NY 39 Aridia Espinal (D) Assem. NY 53 Maritza Davila (D) Assem. NY 72 Carmen N. De La Rosa (D) Assem. NY 80 Nathalia Fernandez (D) Assem. NY 84 Carmen E. Arroyo (D) Assem. OR 22 Teresa Alonso Leon (D) Rep.
OR 38 Andrea Salinas (D) Rep.
RI 02 Ana Quezada (D) Sen.
RI 08 Sandra Cano (D) Sen.
RI 11 Grace Diaz (D) Rep.
RI 56 Shelby Maldonado (D) Rep.
TN 26 Dolores Gresham (R) Sen.
TX 06 Sylvia Garcia (D) Sen.
TX 21 Judith Zaffirini (D) Sen.
TX 49 Gina Hinojosa (D) Rep.
TX 50 Celia Israel (D) Rep.
TX 75 Mary Edna Gonzalez (D) Rep.
TX 77 Evelina Ortega (D) Rep.
TX 107 Victoria Neave (D) Rep.
TX 116 Diana Arévalo (D) Rep.
TX 124 Ina Minjarez (D) Rep.
TX 143 Ana Hernandez (D) Rep.
TX 144 Mary Ann Perez (D) Rep.
TX 145 Carol Alvarado (D) Rep.
TX 148 Jessica Farrar (D) Rep.
UT 001 Luz Escamilla (D) Sen.
UT 024 Rebecca Chavez-Houck (D) Rep.
UT 026 Angela Romero (D) Rep.
VT Chit6-7 Diana Gonzalez (Prg.) Rep.
VA 19 Elizabeth R. Guzman (D) Del. VA 51 Hala S. Ayala (D) Del. WA 37 Rebecca Saldana (D) Sen.
WA 021B Lillian Ortiz-Self (D) Rep.
WI 008 Jocasta Zammarripa (D) Rep.
WI 021 Jessie Rodriguez (R) Rep.
WV 16 Patricia P. Rucker (R) Sen.
Of the 127 women serving in the 116th Congress, two are Native American/Native Alaskan. See Congress. Of the 86 women serving in statewide elective executive offices, one is Native American/Native Alaskan. See statewide office. Of the 1,875 women state legislators serving nationwide, 20 are Native American/Native Alaskan (as of 12/31/18). See state legislatures. AK 25 Charisse E. Millett (R) Rep.
AK 38 Tiffany Zulkosky (D) Rep.
AZ 07 Jamescita M. Peshlakai (D) Sen.
AZ 07 Wenona Rae Benally Baldenegro (D) Rep.
MN 41B Mary Kunesh-Podein (D) Rep.
MN 42B Jamie Becker-Finn (D) Rep.
MN 46A Peggy Flanagan (D) Rep.
MN 62B Susan Allen (D) Rep.
MT 08 Lea Whitford (D) Sen.
MT 16 Susan A. Webber (D) Rep.
MT 41 Rae Peppers (D) Rep.
MT 42 Sharon Stewart-Peregoy (D) Rep.
NM 04 Sharon E. Clahchischilliage (R) Rep.
NM 05 Doreen W. Johnson (D) Rep.
NM 26 Georgene Louis (D) Rep.
OR 43 Tawna Sanchez (D) Rep.
WY 08 Affie B. Ellis (R) Sen.
Of the 127 women serving in the 116th Congress, one is Middle Eastern/North African. See Congress. Of the 86 women serving in statewide elective executive offices, none is Middle Eastern/North African. The number of Middle Eastern/North African Women in state legislatures is still being calculated and will be posted when available. 2019 numbers will be posted when available. Of the 127 women serving in the 116th Congress, one is multi racial. Find out who's in Congress. Of the 86 women serving in statewide elective executive offices, one is multi racial. Of the 1,875 women state legislators serving nationwide, 12 are multi racial (as of 12/31/18). See state legislative offices. Of the 100 largest U.S. cities, none has a multi racial woman mayor. * This list includes women state legislators who have self-identified as multiracial. in Elective Office fact sheet.